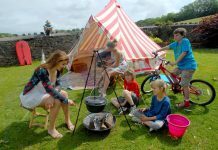 When traveling, staying in hotels can give you a sense of the people, but camping abroad gives you a feel for the land itself. 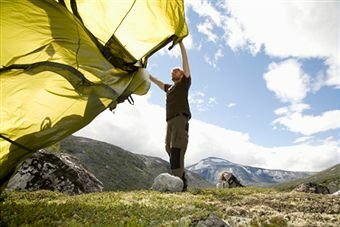 However, camping far from home requires more forethought than setting your tent in your own backyard. 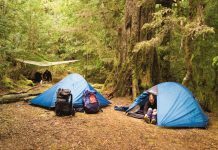 Differences in weather, wildlife, safety and local laws make camping while traveling abroad a challenge, albeit a worthwhile one. Prepare for your trip, and you’ll be rewarded with experiences you could never find at home. Research the region you’ll be calling home for a time. Knowing what kind of weather you’ll face informs your packing decisions, while knowing about the habits of the wildlife will keep you safer. If you’re traveling in bear country, for example, you’ll need to take special precautions with your food and food-related waste to avoid drawing the creatures’ attention. Camping in some parts of Africa or Asia requires netting or repellents to ward off mosquito-borne illness. Even small details require thought; your short tent pegs may work well in your region’s dense clay soil, but will they suffice for sandy desert terrain or rocky land? 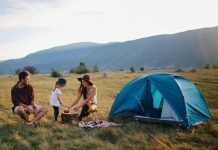 One of the greatest boons to campers since the advent of batteries is that GPS monitors make your camping trip safer without hampering your freedom. Having a phone with GPS tracking capability can save your life if you become ill or injured while camping abroad. Keep a friend or family member up to date on your movements and check in on a regular basis, particularly if you’re camping in a challenging environment. 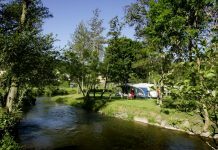 Find out if the region you’re visiting has specific laws governing camping. Some countries limit your stay, while others have stringent regulations about garbage disposal. Find out which municipalities allow campfires and which require camp stoves before you build your fire. Visiting your destination’s website or calling the regional board of tourism will give you all the information you need to know. The health insurance that covers you well at home may not extend abroad. 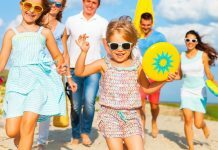 Companies providing travelers health insurance that specifically covers illness or injury sustained while camping abroad typically charge little for the policy. It’s worth the investment; health care costs for uninsured travelers can be exorbitant.